Be curious. Be kind. Be brave. The article Justice For All, by Lina Mai – dated February 23, 2018, in Time For Kids, caught my attention immediately. As an educator, I am always interested in the experiences of students in our schools – especially the supports they enjoy, as well as the challenges they face. I was immediately drawn to the photo and how happy they seemed to be studying together. I read the caption and was intrigued. History makers? Little Rock Nine? These parts were confusing to me. 1957? Ok, I could see the setting and the clothing were “old-fashioned,” but it wasn’t really that long ago. As I continued reading, I realized this article was focusing on something more than the happy photo suggested. These were the students who made integration in our schools possible. These people were pioneers – heroes. These were the first students to represent the ruling of the Supreme Court that segregation in public schools was illegal. These were the first brave people to walk into an all-white school in the south and demand they be allowed to experience what every other student in that school enjoyed – an education. This was one of the defining moments in history where people, in this case young people, had to endure horrible conditions in order to make this world better. I cringe when I read about their treatment. It took over three weeks before they could actually enter the building, even though they were expected much earlier. They faced mobs, some even placed there by the government of Arkansas! By the time they were able to attend, they needed the protection of the United States Army to keep them safe! Even with this protection, they endured everything from heckling to physical abuse. They were called names, pushed down stairs, and even spit upon. Just reading this now, so many years later, makes me cringe. Throughout it all, they remained dignified and determined, at least publicly. 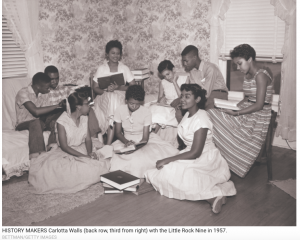 Carlotta Walls LaNier, one of the Little Rock Nine, said, “I considered my tormentors to be ignorant people.” I’m not sure I would have been so kind with my own words. Michael Brenes, a historian at Yale University told Time Magazine in this interview that the photos of the horrifying things that went on helped garner support for these people and for desegregation everywhere in our nation. They became known as the Little Rock Nine because that was the name of where the school they attended was and there were nine of them. Overall, we owe a great deal to their courage, bravery, and convictions. They helped integrate our schools where we are able to learn so much from each other and see each other as people, not a certain race, religion, or whatever. We treat each other as human beings who all have the same rights and should enjoy the same treatment and opportunities. I would love to say we have arrived, but no one can deny that problems still exist. However, fewer and fewer people will tolerate inequitable treatment of others for any reason and the work and bravery of the Little Rock Nine is a big part of why that is. It also shows that real change in this world can happen through the good work and bravery of our children. Let’s hope they continue to make these positive changes and truly decide to be the positive change this country and the world need. A place to share our thoughts!